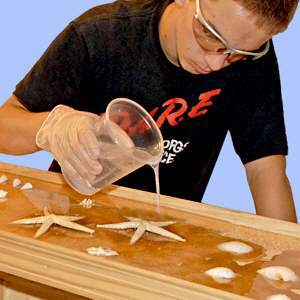 Pouring Tarbender™ - After mixing, pour a thin stream along the entire length of the surface. Do not exceed 1/16” (1.6 mm) for this layer. Your goal is to obtain an even coating. Let Tarbender™ cure for 4 hours before applying another layer. Note; do not exceed ¼” (6.4 mm) thickness per pour. If greater thicknesses are desired, pour in layers of ¼” (6.4 mm) with 4 hours minimum between layers. Dissipating Bubbles from Surface Using a Propane Torch - After Tarbender™ is poured, pass a propane torch (available at any hardware or DIY store) back and forth lightly over surface to dissipate bubbles. Be careful when handling the torch and do not get closer to the surface than 3” (7.62 cm). If pouring multiple layers, use a propane torch to dissipate bubbles after pouring each layer. Apply In Thin Layers - two thin layers of Tarbender™ are recommended for a smooth, uniform coating. Using chip brush, apply 1st thin layer to surface and let epoxy partially cure until “tacky hard”. Apply 2nd thin layer. Allow both layers to fully cure. Adding New to Old - If too much time passes (72 hours or more) between applying layers of Tarbender™, delaminating may occur if you try to add more. For Best Results; lightly sand cured epoxy surface with 220 grit sand paper and wipe clean with denatured alcohol before mixing and applying new Tarbender™.